While I have lately been moved to comment on the events that effect us nationally and globally, I have not forgotten that we all feel the need to prepare for what our souls tell us is coming. Although I feel that spiritual preparation is of the utmost importance, we do have to live these physical lives, and there is a need to return our gaze to the ways in which we can persist in our daily living, should we face the unthinkable. With that in mind, I've always loved the American story. We are truly the "Land of Opportunity"; a nation that I believe God sanctified for His purpose. We have an honorable history of individuals who see a need on the part of their fellow citizens, and meet it. Fledgling, start-up companies present their wares to the marketplace, and if the product or service is good, then the public will find it. And if I know that the motivation behind these self-made American companies is ethical and reliable, then I am only too happy to do my part to support them. 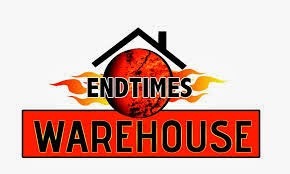 One such company is End Times Warehouse. According to the owner, "the website and company is relatively new. We don't have much of a budget, so we are building this ourselves and going through the internet marketing learning curve while still working and raising a family. We are adding products and tweaking everything along the way." This is the American way! At this time, the products they offer are limited, compared to other emergency preparedness giants, such as Emergency Essentials. But we all have to start somewhere right? I was especially thrilled to see that the first item on their product list was Bibles. They've certainly got their priorities in the right order! It turns out that the owner's brother is a minister and the company name was his idea; so not only do they have their priorities straight, but they know what time it is on the prophecy calendar. But they make it clear that you do not have to be religious to take advantage of the products they offer. EndTimes Warehouse is striving to meet any emergency preparedness situation that you might experience. Whether it is a disruption of our food supply due to natural disasters or man-made scenarios, they have partnered with well-known companies to serve as a clearinghouse of any number of things you might need. They were generous enough to let me try a sample-pak of their freeze-dried food products by Wise Company. Although Wise is not known for being the cadillac version of ready-made meals, I found the variety of meals and the taste to be quite acceptable. When we actually encounter SHTF, they will taste like a gourmet feast! As you will see when you visit the site, some of their categories are light in items offered, but as I said, they are new and growing. Please take the time to visit the site, and in these days of a suffering economy, let's encourage a nascent company, developed in the spirit of American ingenuity. Another company that I would like to revisit is Deadwood Stove Company. I've never been comfortable with advertising partnerships on this blog, because I see this blog as a gift from God, and to God. So, although I display the Deadwood Stove link on this page, I do it as a service to my friend and neighbor, who is the owner of the company; and as a benefit to my readers. I personally know of the hard work that goes into building each and every Deadwood Stove by hand. (Just think of welding iron in the hot Texas summers!) And it meets such a vital need in the Survivalist/Prepper world. My husband, Peace-Loving Warrior, and I own 3 Deadwood Stoves and employ them quite often. (You can see me cooking on one in this YouTube video.) But when SHTF comes down, or the grid is compromised, they will be an important aspect of our survival. In fact, this stove provides you with two of the most important aspects of surviving... the ability to cook most any game or food you can procure, and the ability to boil water. If the stove could provide a shelter, it would cover the three most important considerations of any survival situation (food, water, shelter). Two out of three ain't bad! PLW will tell you that he likes the adaptability of the Deadwood Stove over other rocket stove manufacturers. (He's tried them all!) 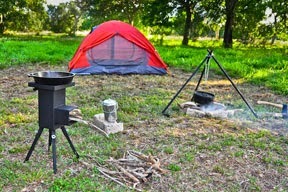 While any bio mass fuel will work, he likes how the Deadwood Stove makes better use of our indigenous Mesquite and Oak. He can control the intensity of his fire better through the unique design of the feeding tube, and the flip grill allows for direct flame cooking, if you want to "flame kiss" your steaks or burgers. Also, this grill alternative all but eliminates the "hot spot" you can experience in the middle of your pan. So, if you've wondered about the image of the Deadwood Stove that appears on my blog each day, take a moment and click on it to see the advantages of adding this to your survival equipment. I promise you, there is no revenue exchanged for this tidbit of information --- PLW and I just get to enjoy lunch and lively conversation every Wednesday with the entrepreneur and his wife; that's enough compensation for me. But I urge you to consider purchasing the Deadwood Stove and get some practice using it. Don't wait until it's too late and you're faced with "I wished I had...". Thank you for allowing a little promotion on the behalf of two companies who still apply the American spirit to their enterprises. They're small, independently owned companies; each has something to offer, and I hope you will check them out. Proverbs 13:4 "The soul of the sluggard craves and gets nothing, while the soul of the diligent is richly supplied."